A brown river of sediment flows into a storm drain, taking chemicals, oil, and other pollutants from streets and yards with it. Polluted runoff is one of the most harmful sources of pollution to the Bay and its waters, and it's increasing. As rain water runs off our streets, parking lots, lawns, and other surfaces, it picks up pet waste, pesticides, fertilizer, oil, and other contaminants. This polluted runoff typically is not filtered in the way that wastewater is treated at a sewage plant. If the draining water doesn’t evaporate or soak into the ground, it flushes straight into local creeks, rivers, and the Chesapeake Bay, adversely affecting water quality and aquatic life. Currents of runoff scour stream banks, destabilize the natural contours of the streams, and even alter their depths. They muddy drinking water sources, and also carry bacteria, making the treatment and use of such water more expensive. Eroded dirt from the runoff blocks sunlight from reaching underwater grasses, and smother the aquatic homes of oysters and other life. As grasses and marine life die, fish and other creatures that rely on them are imperiled. The runoff also carries nutrients that spur algae blooms that cause low oxygen and kill fish. Not only wildlife is endangered by stormwater pollution. The state of Maryland cautions people not to swim in waterways for 48 hours after a heavy rain. Polluted runoff carrying bacteria has resulted in serious illnesses. Also, in urban and suburban areas where ground surfaces have been hardened and the polluted water has no place to go, local streets and basements often flood, causing repeated and costly damage to homes and businesses. Urban and suburban polluted runoff is a significant source of nitrogen pollution that continues to grow in the Chesapeake watershed. Pollution discharged from sewage plants, agriculture, and other major sources is declining. This problem with runoff is one of the main reasons the Bay remains on the "dirty waters" list of the U.S. Environmental Protection Agency (EPA). Climate change promises, and even now is delivering more frequent and intense storms. These heavy rains will wash more pollutants from the land. Computer modeling by the Chesapeake Bay Program suggests 9 million more pounds of nitrogen will wash into the Bay due to climate change and 500,000 pounds of phosphorus. The larger volumes of water traveling at higher velocities will wreak ever more havoc. Already, the northeastern United States has seen dramatically more rainfall during heavy storms in recent decades. The summer of 2018 saw record-setting rainfall in many parts of the Bay region. With those downpours came severe flooding and property damage. 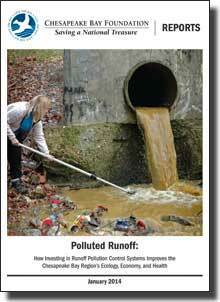 States and localities are failing already to deal adequately with polluted runoff. None of the six states in the Bay watershed, or the District of Columbia, is meeting its Chesapeake Clean Water Blueprint goals to reduce polluted runoff. Climate change will add to their burdens. So too will sprawl development. Sprawl is insufficiently managed growth that gobbles up farms, forests, and other natural areas, that typically would soak up the runoff. 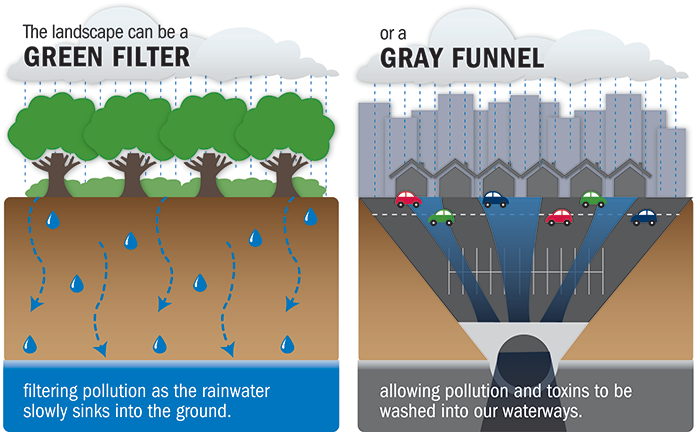 More impervious surfaces mean fewer of the "green filters" that nature provides, and more polluted runoff. One promising solution is greening the landscape strategically, a tool called "green infrastructure." The idea is simple: slow down and soak up runoff. 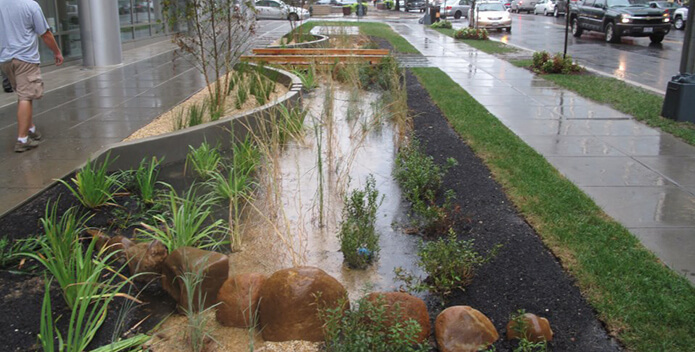 Build "rain gardens" and other natural areas in key drainage areas. Where possible, replace old pavement with pervious pavement. Plant gardens on rooftops. These and other green solutions not only are cost effective; they provide secondary social benefits: shade, wildlife habitat, a more pleasant neighborhood, to name a few. We call this the green filter approach to managing runoff. CBF is introducing local Bay jurisdictions to a new way of financing these green filters. It's called "impact investment." It helps slow down and soak up runoff, and also creates local sustainable jobs and more healthy, vibrant communities. At the dawn of every new year, shortly after the ball drops and the confetti is swept away, our Bay saving efforts kick into another gear. With the new year comes the start of legislative sessions in Maryland and Virginia, and its continuation in Pennsylvania. 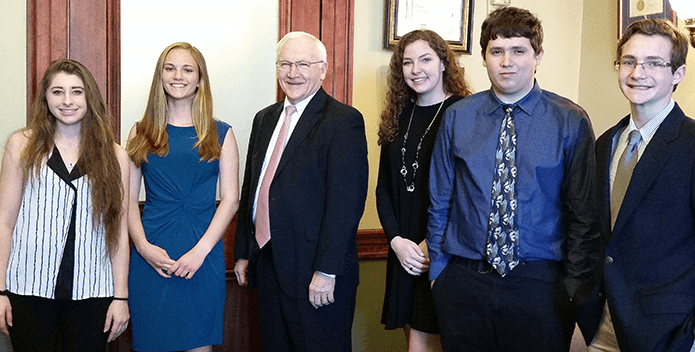 Despite stalling out in the Pennsylvania House, these students aren't giving up on saving and recognizing Eastern hellbenders. 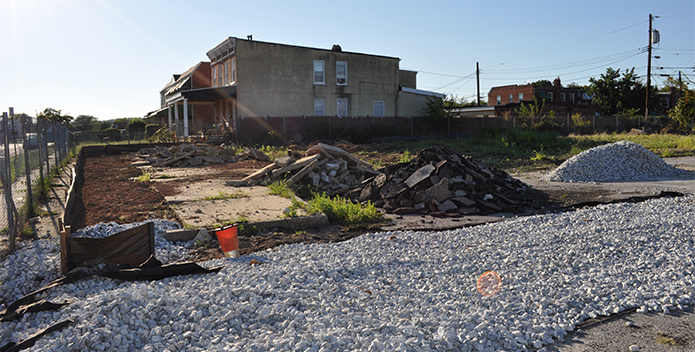 Garden mud, rain, and rocks were Rafiyqa Muhammad's playground growing up in a south-Harrisburg, PA neighborhood. Today, she's back in that neighborhood, empowering the community through rain gardens and green infrastructure. 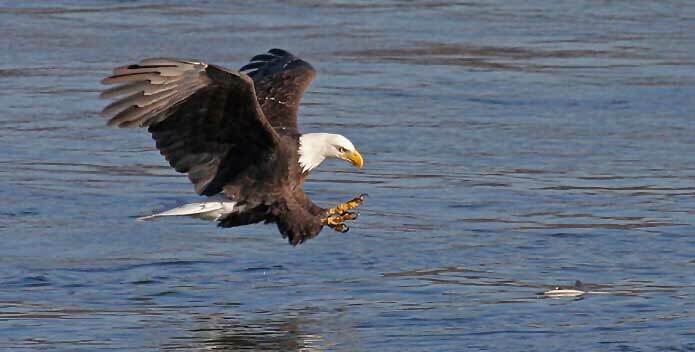 Every day we all witness a growing threat to the health of the Chesapeake Bay and its rivers and streams. Exciting news! 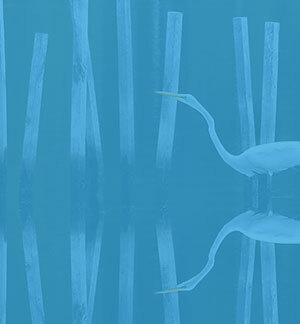 Last week, in a first of its kind project in Maryland, the City of Baltimore and Chesapeake Bay Foundation announced a new strategy for improving neighborhoods while reducing water pollution at the same time. 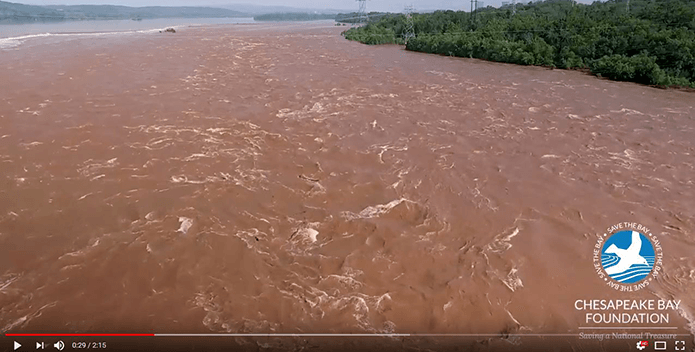 This video captures the devastating effects of heavy rains that pummeled Pennsylvania the week of July 23, 2018. These scenes were shot on July 26, the day before the river crested. 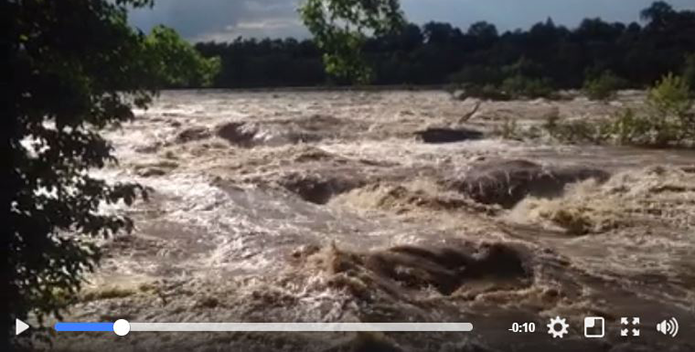 The James River in Richmond overflowed its banks after heavy rain washed huge amounts of dirt and pollutants into the current. Clear, clean water turned the color of chocolate milk. Even days after the storm the surge continues as runoff flows 200 miles downstream from the headwaters. In the summer of 2016, CBF tested bacteria levels in local Pennsylvania streams after heavy rains, finding troubling results. 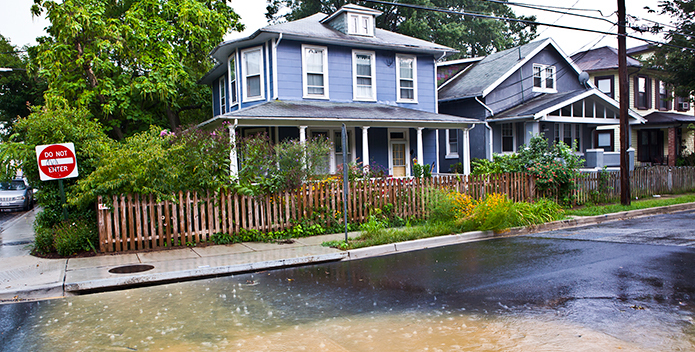 Polluted Runoff: How Investing in Runoff Pollution Control Systems Improves the Chesapeake Bay Region's Ecology, Economy, and Health details the problems created by suburban and urban runoff pollution. And it offers steps that local, state, and federal governments can take to reduce pollution and achieve clean water for local streams, rivers, and the Chesapeake Bay.